City Point Press, 9781947951068, 272pp. The fast and furious forces of change stimulated by technology, demographics, lifestyles, and economic, environmental, political and regulatory impacts -- or any number of these in combination – are easy to see. They are easy to talk about. They are easy to intellectualize. The problem? The answers are hard to execute and require nuanced combinations of leadership, skills, strategy and tactics. On top of that, innovation has moved from an abstraction that will matter at some distant date to a front-and-center deliverable that must show evidence of impact in the space of the calendar quarter. 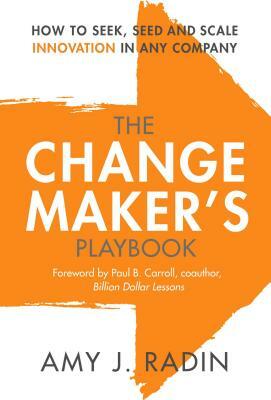 In the stories, tools, techniques and advice inside The Change Maker’s Playbook, leaders will find tangible steps to find and safeguard the plans that will deliver the sustainable business-changing impacts – new customers, new relationships, new sources of value and growth— their businesses need. Separated from the pack of academic and consultant innovation theories, Radin’s approach stems from her own experience sitting in the innovation hot seat at some of the world’s most demanding companies and is bolstered by interviews with 50 corporate executives, founders and startup investors representing media, e-commerce, payments, healthcare, government, professional services, and not-for-profit sectors. The book walks readers through Radin’s adaptive, 9-part framework, engaging them in ready-to-apply techniques. Her work shows leaders how to find the big ideas that will meaningfully address customer needs, take the insight from idea through implementation in a way that delivers in the short and long-term for the organization, and lead effectively through the obstacles that tend to derail or diminish innovation. Three phases – Seeking, Seeding and Scaling – organize the framework within an intuitive, logical and useable format, with concrete actions outlined every step of the way. The answer to the dilemma every business faces today is that innovation is exhilarating, rewarding and even fun when it is approached as a unique challenge, but it can also be polarizing, unpredictable, and scary. Success requires that leaders rethink how they lead innovation. Leaders know they must set aside preconceived notions of what works, and look to those who have already walked in their shoes. This is why The Change Maker’s Playbook was written, and why it will become an ongoing resource for any innovation leader. Paul Carroll is the Editor-in-Chief of Insurance Thought Leadership, a digital publishing platform that is a catalyst for change in insurance and risk management. The site curates the work of more than 1,000 thought leaders and has 60,000 subscribers to its weekly newsletter. A thought leader on innovation, Paul is a co-founder of and partner with the Devil's Advocate Group, a strategy consulting boutique. He spent 17 years as a reporter and editor at the Wall Street Journal. He was nominated twice for a Pulitzer Prize and was a finalist in 1996. Later, he founded and edited Context magazine, which was a finalist in 2001 for the National Magazine Award for General Excellence. He is the co-author, with Chunka Mui, of "The New Killer Apps: How Large Companies Can Out-Innovate Start-Ups," and "Billion-Dollar Lessons: What You Can Learn From the Most Inexcusable Business Failures of the Last 25 Years," based on research by a team of 20 that spent two years investigating 2,500 major write-offs. Paul's first book, "Big Blues: The Unmaking of IBM," was a major best-seller in 1993. As a fellow changemaker, I've long admired Amy Radin's impact and resilience. In The Change Maker's Playbook, she offers a practical guide to getting to the other side of change in a way that creates value and meaning. An important resource for anyone looking to innovate better.